The story of more than 55 million people who succumbed to “America fever” and emigrated from Eastern Europe in the century before World War II. In this unusually penetrating view of “one of the greatest migrations in human history,” MacArthur fellow Zahra (Modern European History/Univ. of Chicago; The Lost Children: Reconstructing Europe's Families after World War II, 2011, etc.) analyzes the complex motives that drove the behaviors of migrants and nations during years (1846-1940) of tumultuous human movement. Individuals, facing economic and other pressures at home, wrestled with the conflicting advice of earlier migrants: “There is happiness here,” said a Detroit letter writer in 1891; others cautioned friends in the old country to stay home. 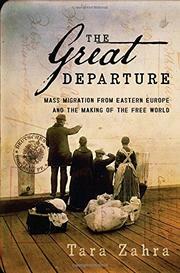 Indeed, many disappointed migrants found that their “greatest hope was to return home.” Meanwhile, Eastern European officials linked westward emigration to “slavery, exploitation, and moral ruin,” seeking to retain the most desirable citizens as workers and conscripts while encouraging ethnic and religious minorities to leave. European governments’ manipulation of emigration extended to creating colonies of settlers in Brazil, Argentina, and elsewhere and maintaining state-sponsored boardinghouses in major U.S. cities, all aimed at reinforcing attachment to home countries. At the same time, European states arrested and tried travel agents accused of seducing migrants into leaving for America. Writing with an ease and authority borne of a mastery of her material, Zahra uncovers the common threads that characterized these migrations from the time of the Austro-Hungarian Empire through the Depression, world wars, and refugee crises. Using letters, diaries, and the work of authors from Joseph Roth to Louis Adamic, Zahra brings to life the sometimes-shattering effects of migration on marriages and families. Her reflections on the meaning of freedom, as well as the conflict between the individual’s right to move and the well-being of his or her homeland, add greatly to the richness of this account. A significant work of social history bound to please serious readers and scholars.